You Only Live Once. YOLO. 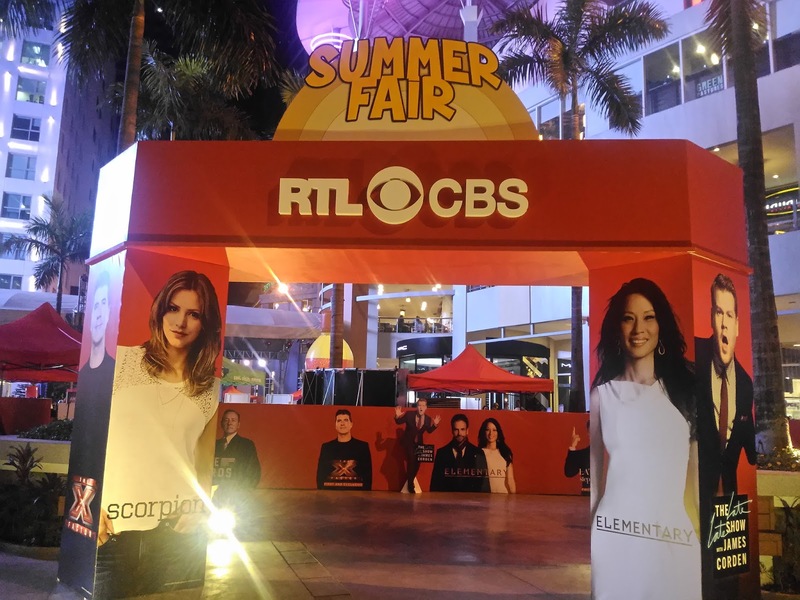 Last weekend, RTL CBS made that phrase happen by bringing fun and entertainment with booths, food and all that glam that comes with stardom. for their family. 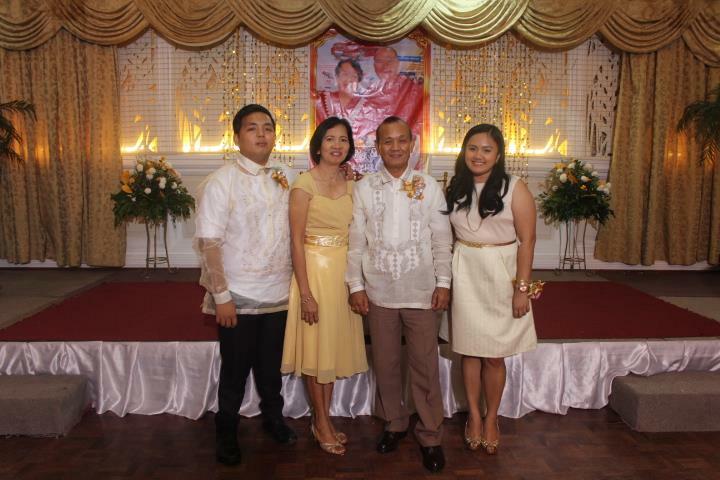 I also am a product of an OFW Dad, and I can attest that he gave us the best of the best in life. Summer spells fun for many. 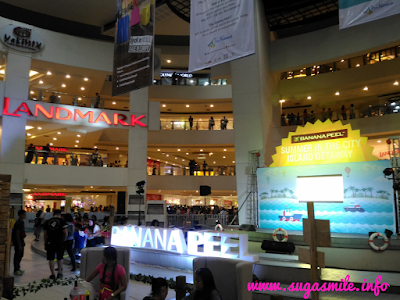 But for those of us working and could not find the time even for a quick getaway, Banana Peel brought the island to us last May 7 at the Trinoma Activity Center. It was a fun and relaxing day to remember. Chocolates makes us happy. And once we crave for them and get it, it gives an uncomparable bliss. With Magnum, continue to have that best chocolate experience as they recently launched their two new flavors - Magnum Infinity Chocolate & Caramel and Chocolate and Raspberry! 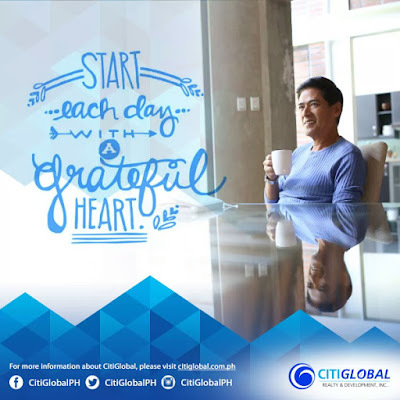 CITIGLOBAL Realty and Development Inc. continues to value the lands of their partners because they know that they acquired them together with the sweat and blood their ancestors. They know that to gain the title and ownership of these properties required hard work and love. Every year, Closeup wants you to get intensely close. It's that time of the year again where you can enjoy the awesome music festival that brings you and your friends closer. 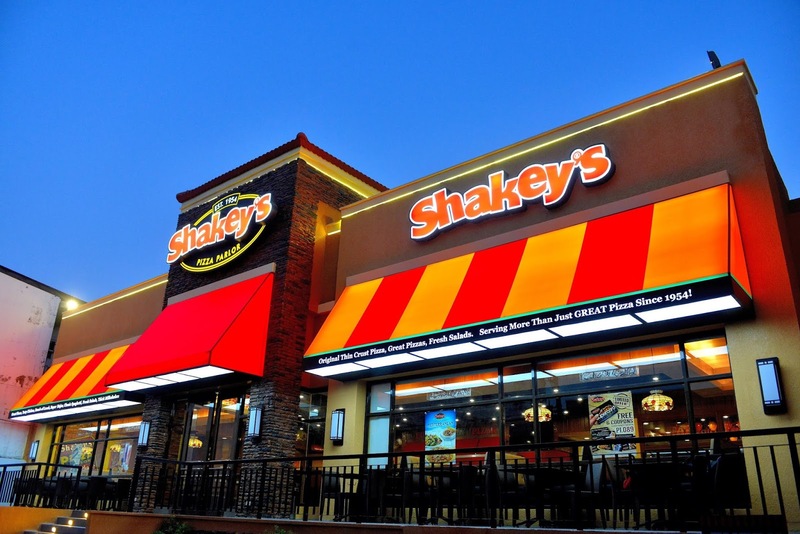 We Filipinos take food and eating out seriously. 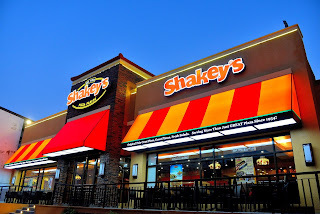 These days, it's not just about an establishment, but the experience of going out with your family and friends, together with a good menu to enjoy. 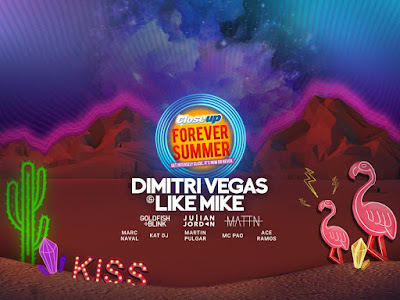 Vote at the M&M's 2016 Campaign and Win Prizes! Today is finally the day! 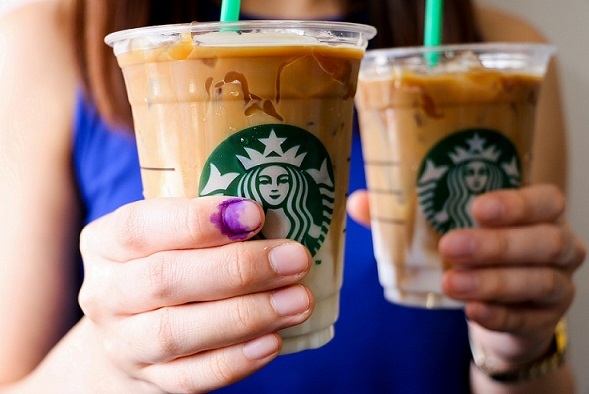 Take stand and exercise your right to democracy today, May 9, 2016. Let us be responsible citizens and vote for the future leaders of our country. Reward your mom with a well-deserved weekend staycation from May 6-9. Starting from Php 5,500 nett, enjoy an overnight stay with breakfast buffet at Food Exchange Manila for the family*. Mothers enjoy a recharging wellness drink and Mother’s Day surprise from us. 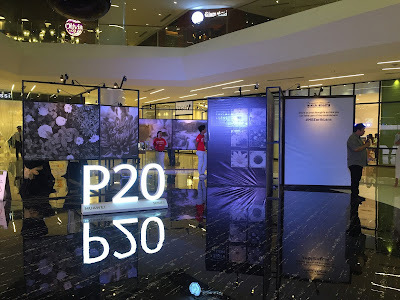 Guests at the Food Exchange Manila during Sunday Brunch (May 8) can also treat their moms to a FREE mini-makeover to celebrate the star that she truly is. Isn't it time to give back to our moms? Call (02) 990 7888 today. This year has been the most challenging year for us. I've seen you go in and out of the hospital before, but this one made us really frightened about your health. When I was in college, I always offer my novena to the Mother of Perpetual Help so I could get good grades and graduate on time. Sometimes, I even pray to help me finding the man I could spend forever with. But this time, it was different. I was praying that you wouldn't get cancer. And that broke my heart more than any boy could. When Nanay was diagnosed with cancer years ago, you were the one who held the family, no matter what. You were the one who made us strong, despite her succumbing to her sickness. And when you said that you needed to be operated, I felt that I had to be strong for you. But how can you be strong when the person whom you've never seen weak suddenly feels like one? It was the longest weekend of my life, when you said that you needed to be operated. When you were supposed to be having the time of your life in Siargao, you backed out and scheduled the operation immediately. How I was so proud that even in the moment, you still stayed strong. Maybe if I were in your place, I would easily break down and shut the world. But still, I needed to be strong because I can't let cancer affect us again. Not when it took too much of us already. Thank you Mama, for bringing us more closer. I remember that growing up, I would rather share my secrets to Tita Pin or Tita Sol, because I felt that they can listen to me, more than you could. I had to understand that we can only see each during weekends because you had to work. But I appreciate how you would spend time to travel to and from Manila and Novaliches. If you haven't, I would not be sent to good schools and have a comfortable life right now. Lastly, thank you, Mama, for raising me up well. There are times when I question if I had been a good daughter, but the fact that we are in good terms, make me feel that I am. There are no enough words to thank you, but please always know that you have me, no matter what. How about you? Have you thanked the most important woman in your life lately? May you be close or not, always remember that once upon a time, an umbilical cord connected you to only one person - your Mom, Mama, Mommy, Mudra, Ina, Nanay! 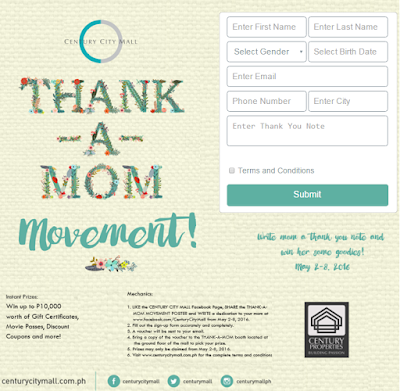 And this Mother's Day, lets stop with all the politics first, and make your Mom feel special, with surprises to add, by joining Century City Mall's "Thank A Mom Movement". Share the Thank-A-Mom Movement Poster above and write a thank you note for your Mom and tag Century City Mall's Facebook Page from May 2-8. 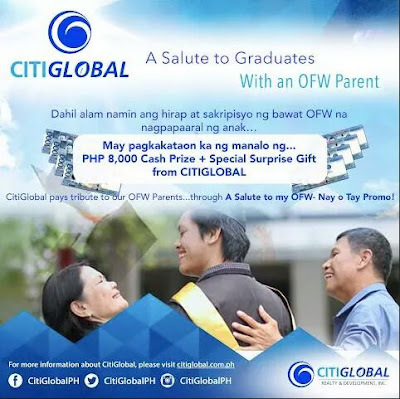 Fill out the sign up form at https://www.facebook.com/CenturyCityMall/app/269862423359705/ and a voucher will be sent to your email. 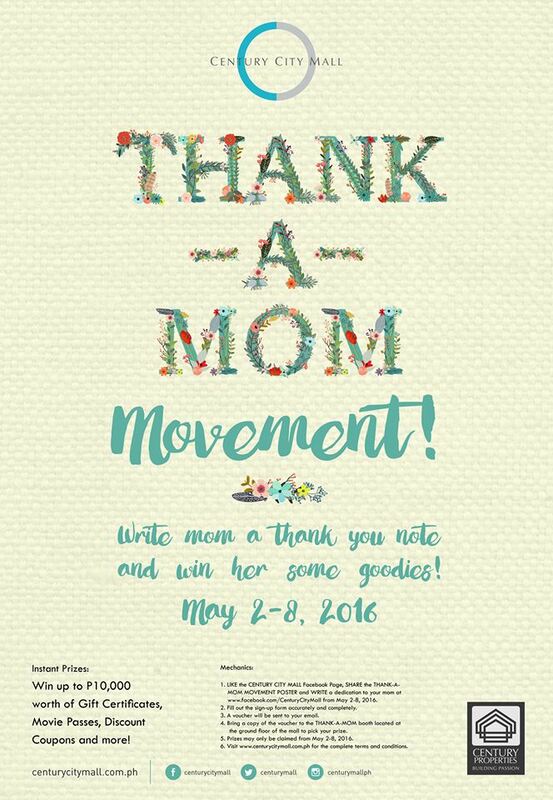 Once received, print the voucher and go to the Thank-A-Mom booth located at the Ground Floor of Century City Mall to pick a prize. You may win Php10,000 worth of prizes like gift certificates, cinema passes, discount coupons and more! Prizes may only be claimed from May 2-8, so make sure to join now! 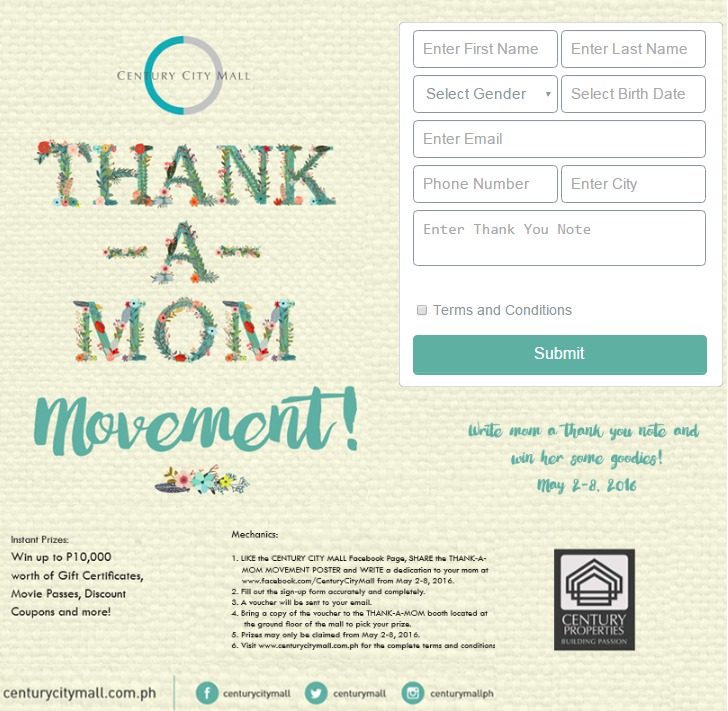 For more information about the #thankAMomMovement@CenturyCityMall, you may visit their website at www.centurycitymall.com.ph. You can also follow them on Twitter @CenturyMall or Instagram @centurymallph. 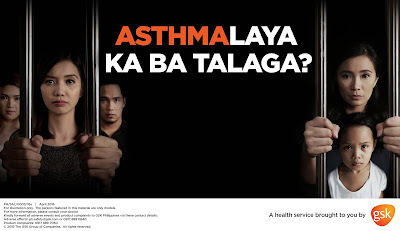 Did you know that according to the Global Asthma Report, an estimated 300 million people worldwide are affected by asthma? Just in the Philippines, there are approximately 11 Million or 1 out 10 Filipinos who are suffering from this debilitating disease. With this incurable disease, it prevents the patient from living their life to the fullest as they have to restrain themselves to a more active lifestyle. 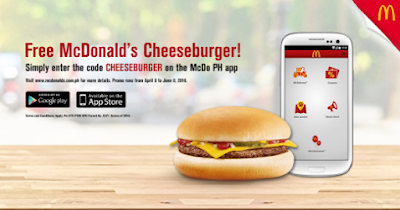 Your McDelivery experience can now be made more exciting! Enjoy a free Cheeseburger coupon by downloading the McDo PH App and signing up for an account. Not only will you have a new tool to help satisfy your sudden McDonald’s cravings, you will also get to receive special treat! 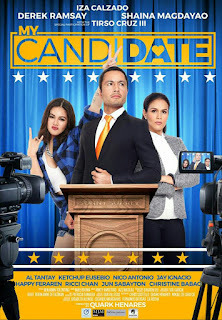 With the upcoming elections, Quantum Films, MJM Productions, Tuko Film Productions and Buchi Boy Films gives us a new film about love, romance and even politics with "My Candidate". 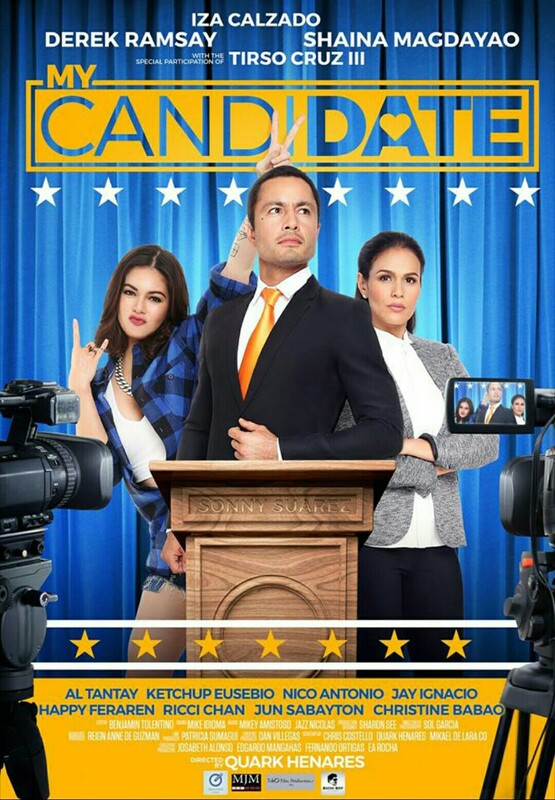 Stas Derek Ramsay, Iza Calzado and Shaina Magdayao, this movie will surely make you laugh and fall in love even in the midst of the pressures of election.